Cook tortellini according to directions. In the last minute of cooking, add zucchini to boiling water. Drain and rinse in cold water. Place in a large bowl. 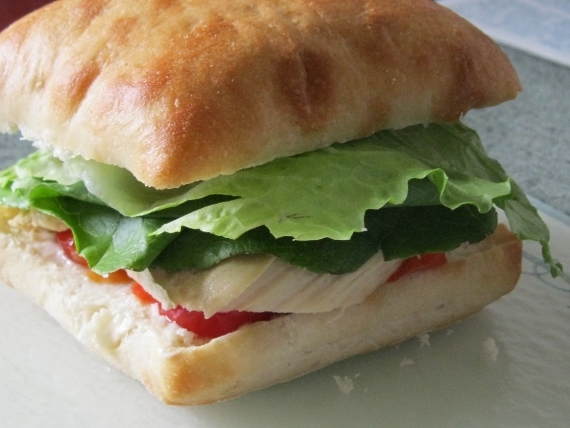 Add chicken, dressing, cheese and olives – toss well. 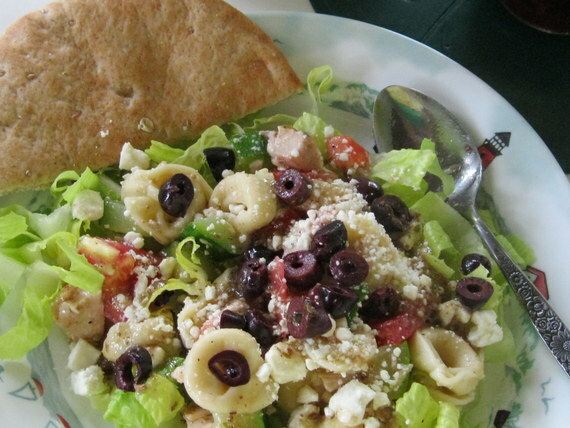 Serve over salad greens with a whole wheat pita half on the side. SUPER FAST AND EASY!! GREAT ON A HOT SUMMER NIGHT! Cook the chicken in the oil for a few minutes then pour the chicken and the oil into the crockpot. (I usually skip this step – eliminate oil and just add my chicken into the crock pot. Saves time, fat, and energy! )Add the lime juices, garlic, cumin, salt, chili, and red pepper. Stir to coat and cook on low for 6 hours. During the last hour, add the onions and green peppers – stir to coat. Serve on warm tortillas with garnishes such as sour cream, black olives, cheese, tomatoes, etc. THIS IS BY NO MEANS A LOW FAT DISH BUT THERE ARE A FEW THINGS YOU CAN DO TO CUT FAT WHICH I HAVE NOTED. ALSO JUST HAVE A SMALL PORTION AND LOAD UP ON A NICE VEGETABLE (I CHOSE STEAMED BROCCOLI) AND A BIG SALAD. WE ALSO HAD STRAWBERRIES WITH LITE WHIPPED TOPPING FOR DESSERT! Preheat oven at 400 F. Coat a 2 qt. baking dish with non-stick cooking spray. Add the first 8 ingredients and mix well. 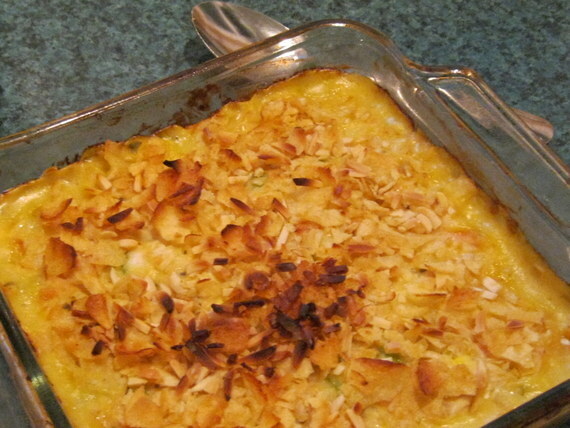 Top with potato chips and almonds. Bake 30- 35 minutes until topping becomes golden brown. In large bowl combine chicken, apple, celery and grapes. In a small bowl combine mustard, mayo, raspberry vinaigrette and relish. Add to chicken mixture and combine well. Serve over a bed of spinach, mesclun mix or your favorite lettuce. Put a large pot of water on to boil for cooking pasta. Meanwhile, place chicken on to grill. Transfer the chicken to a cutting board. When cool enough to handle, shred into bite-size strips. Whisk peanut butter, soy sauce, garlic, and chile-garlic sauce in a large bowl. Cook pasta in the boiling water until not quite tender, about 1 minute less than specified in the package directions. Add vegetables and cook until the pasta and vegetables are just tender, 1 minute more. Drain, reserving 1 cup of the cooking liquid. Rinse the pasta and vegetables with cool water to refresh. Stir the reserved cooking liquid into the peanut sauce; add the pasta, vegetables and chicken; toss well to coat. Serve warm or chilled. Per serving: 363 calories; 12 g fat (2 g sat, 0 g mono); 44 mg cholesterol; 36 g carbohydrates; 0 g added sugars; 29 g protein; 7 g fiber; 348 mg sodium; 287 mg potassium. *I used a 10 oz. coleslaw mix from a bag!! Crumble ramen noodles onto a large rimmed baking sheet. Add almonds, sesame seeds and canola oil; toss to coat. Bake for 10 minutes. Stir, then bake until the noodles are golden brown, about 5 minutes more. Let cool on the pan on a wire rack. Meanwhile, grill chicken either on an outdoor grill or George Forman Grill. Transfer the chicken to a clean cutting board to cool. Using forks, shred into bite-size pieces. Meanwhile, combine dressing and soy sauce in a small bowl or jar with a tight-fitting lid. Just before serving, combine the shredded chicken, cabbage, carrot and scallions in a large bowl. Add the toasted noodle mixture and the dressing; mix well. Refrigerate the vegetables, toasted noodle mixture, chicken and dressing in separate containers for up to 1 day. Toss together just before serving. You can also make this salad with pork, fish or steak especially if you have leftovers. Coat a 9×13 dish with cooking spray. Mix Olive Oil, Salt, Pepper, Paprika, Garlic Powder & Hot Sauce in the bottom. Cube the potatoes & add to the dish. Stir to coat. 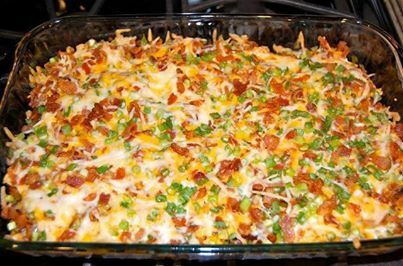 SERVE WITH A NICE VEGETABLE MEDLEY AND FRESH SALAD! I HAD SOME LEFTOVER AFTER A FEW MEALS AND MADE IT INTO A DEEP DISH CHICKEN POT PIE. I PUT THE LEFTOVERS IN A DEEP DISH PREPARED PIE CRUST AND ADDED SOME BABY BROCCOLI FLORETTES AND A 12 OZ BAG OF FROZEN MIXED VEGETABLES. ON THE STOVE I TOOK 1/2 CUP CHICKEN BROTH AND BROUGHT IT TO BOIL AND ADDED 8 OZ PHILADELPHIA CREAM CHEESE GARDEN VEGETABLE (1/3 LESS FAT) BY THE TABLESPOON UNTIL MELTED AND CREAMY. 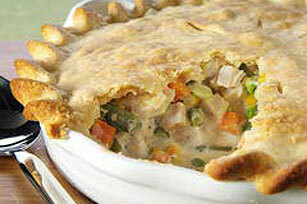 POUR CREAM SAUCE OVER TOP AND BAKE THE POT PIE IN A 350 F OVEN FOR 20 -30 MINUTES UNTIL THE CRUST IS GOLDEN BROWN. COOL BEFORE CUTTING INTO 6 WEDGES. **OFTEN MY PIE CRUSTS COME IN PAIRS SO YOU MAY WANT TO ADD A TOP CRUST WITH AN EGG WASH BUT I USUALLY SKIP THIS TO CUT SOME CALORIES AND HAVE ANOTHER PIE LATER! ONE MORE LEFT OVER CHICKEN BREAST MADE MY HUSBAND THE ENVY OF ALL HIS COWORKERS AT THE LUNCH TABLE! YOU WILL FEEL LIKE YOU JUST STOPPED AT A VERY FANCY RESTAURANT FOR LUNCH! WHEN GRILLING, BAKING OR MAKING CHICKEN IN THE CROCK POT ALWAYS MAKE A LITTLE EXTRA TO TREAT YOURSELF LATER! 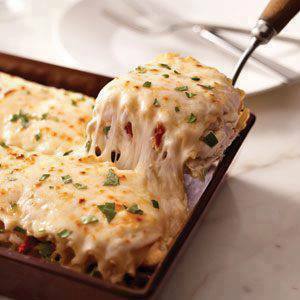 COMBINE chicken, artichokes, 1 cup mozzarella, Parmesan and tomatoes. Beat cream cheese, milk and garlic powder with mixer until well blended; stir in 2 Tbsp. basil. Mix half with the chicken mixture. SPREAD half the remaining cream cheese mixture onto bottom of 13×9-inch baking dish; cover with 3 noodles and 1/3 of the chicken mixture. Repeat layers of noodles and chicken mixture twice. Top with remaining noodles, cream cheese mixture and mozzarella; cover. BAKE 25 min. or until heated through. Sprinkle with remaining basil. Let stand 5 min. before cutting to serve. PERFECT MEAL FOR THE THIRD BLIZZARD OF 2014 IN BUFFALO, NY!